FORTE CULTURA – It goes on! With the foundation and legalisation of the "Association of Fortress Tourism and Fortress Marketing Network" – "FORTS-2-MARKET" – in November 2014, there is now the guarantee to continue networking, marketing and tourism development of FORTE CULTURA in a wider range. With the adoption of a statute and membership fees, there is now also the base to win new members europe wide and to enlarge the network. The purpose and mission of the association is to promote further conservation, the cultural touristic use and the public presentation of the European cultural heritage of fortified monuments as well as the trans-national co-operation in research and knowledge transfer as a contribution to European integration. At the same time the first managing committee of the association was elected, consisting of five representatives from Germany, Hungary and Poland. Read more: FORTE CULTURA – It goes on! With international participation, on 26th November 2014, the project FORTE CULTURA finished successfully with the final meeting in Kostrzyn nad Odra. During the two-day conference, the most important results of the project work packages were presented. These are the foundation of the association "FORTS-2-MARKET", the elaboration of the handbook "Capitalisation of fortified heritage" and of tools for effective e-marketing, the elaboration of the Culture Route FORTE CULTURA, cluster building of regional networks, the elaboration and description of more than 40 travel tours between the fortified heritage, several international conferences, among them the Third International Conference about Fortified Ideal Cities, a travel exhibition, a coloured printed guide book, two data bases and a handbook of typical historic technologies of fortress constructions, two internet platforms and some merchandising products. The concluding conference of the Forte Cultura project in Kostrzyn nad Odra that lasted from November 24 to 27 was accompanied by a small but highly captivating exhibition in Berlin Gate - the visitors centre of the fortress museum Kostrzyn. The exhibited artworks presenting fortifications related art were realized by a member of the project team, Mr Aleksander Jankovic Potocnik, of the Ad Pirum institute in Logatec / Slovenia. Titled "Borderlands", the exhibition encapsulates author's two interests: illustration and fortifications history. The artist explores the fascinating phenomena of fortified frontiers and their impact on people's lives and mode of thinking. Alexander graduated in 1984 at the Faculty of Architecture at the University of Ljubljana. Despite his formal education as an architect his main endeavor was illustrating and cartooning for the then major Slovenian periodicals. Between 1989 and 1994 he was living in Melbourne, Australia, where he completed a Graduate Diploma course in Animation and Interactive Multimedia. He spent the nineties working mostly in the advertising industry. In the year 2000 he was an animator for the Golden Drumstick Award winning team at the Golden Drum Festival. Ms Agnieszka Żurawska- Tatała took part in a co- funded by the European Union Pesto Conference on the promotion and networking of EU projects in Graz (Austria) on the 2nd and 3rd of October 2014 promoting the project Forte Cultura and learning new practices concerning tourism. The main aspect discussed during the conference was the issue of trends and developments in sustainable tourism. 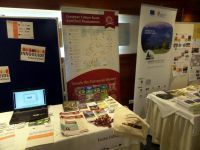 European Network for transfer and exploitation of EU project results in cooperation with Steiermark Tourismus invited all the interested guests together with major target groups to analyze tourist sector, its tasks, responsibilities, sustainability and main impacts on culture, social issues and the environment. During the conference there were discussed the outcomes of the EU funded projects and an exhibition dedicated to the good practice projects. With a dedicated speech, the Italian deputy of the European Council, Mr. Alberto d'Alessandro, has expressed his appreciation for FORTE CULTURA during the implementation conference on 8 October 2014 in Verona. Hardly any other project as FORTE CULTURA could be better contribute to the unification of Europe with some of those factors, which once separated Europe. To convert military equipment to the peace while overcoming boundaries, was one of the main desires of FORTE CULTURA. Especially the northern Italian fortresses should be also taken into consideration. The first European Contact Tour of the Culture Route FORTE CULTURA started on the 30th of August 2014. The event took place during the Kostrzyn Fortress Days and was commenced by a Salut from the historical canon. The representatives of FORTE CULTURA visited twelve fortresses and fortress cities in 6 European countries. Contact meetings took place in: Książ and Nysa in Poland, Olomouc in Czech Republic, Komárom in Hungary, Palmanova, Venice, Verona and Franzensfeste in Italy, Kufstein in Austria and Kronach and Königstein in Germany. "Kostrzyn fortress virtual model" is a visualization which shows 3D elements complied with historical imaging from the years: 1920 – 1925 and was created within the framework of the project "Forte Cultura – Capitalising of fortified cultural heritage for sustainable development and competitiveness of cities and regions". During the virtual walk its visitors will see among the others: 6 bastions (the King, Brandenburg, Philip, the Princes with Prince and the Queen), 3 gates (Chyżańska, Sarbinowska, Berlińska), Farna's Church, buildings of the Post Office, Town Hall, Police Office, a granary, the castle and others which don't exist anymore or became the buildings' mere foundations. Visiting our website you learn new historical facts and get to know more about the fortress revitalization process. "Kostrzyn fortress virtual model" is available on the website: http://www.wirtualnatwierdza.kostrzyn.pl/. We sincerely invite you to a virtual Old Town walk. In August of 2014, the Fortress of Kufstein was officially confirmed by the Joint Technical Secretariat of the EC in Vienna as new project partner in the developing FORTE CULTURA culture route. Kufstein is located in the Tyrol, on the right bank of the river Inn. The fortress is the landmark of the town and the surrounding lower Inn valley. It is considered one of the most important event locations of the Tyrol. The management of VIA IMPERIALIS is located here. Gottfried Preindl, manager of Top City Fortress Marketing, is pleased about the new partnership: "This project is very interesting for us particularly from the aspect of national and international marketing. Through this joint venture we can focus our efforts more efficiently and present our fortress in a European context as part of Hapsburg's imperial heritage." The region of Lviv in the Ukraine was originally included as the twelfth partner in the project FORTE CULTURA. Nonetheless, recent political, social and military events in the country have not allowed the city to actively cooperate within the project framework. Therefore one should appreciate that Lviv new project commissioner, Ms. Liliana Hrytsyshyn, could bring positive messages after her recent visit in Lviv regional administration in late July 2014. The former Ukrainian president used to hinder Ukraine sustainable connection to the European Union. After his fall practical work could be, nonetheless, taken up again. The temporary illegal occupation of the Crimea, after the Ukrainian opinion, has caused the decision to invest in Carpathian region finances earlier intended for the Crimea. On the 4th and 5th of July 2014 at the Citadel in Erfurt the lead partner, project partners and guests participated in a workshop on the fortresses society impact and integration strategies. During the meeting the city of Erfurt presented good method examples and experiences together with other strongholds like how to integrate unemployed into the fortress maintenance and what re-integration results into the workplaces there are. There were also Komárom and Kronach which presented fortresses as major employers with their significant role for the cities social structure.